It’s fair to say the new ultra-thin and sleek MacBook is a laptop from the future, but let’s not pigeonhole it. It’s here, right now, so it must be somewhat of the present. You’re probably reading this, trying to figure out whether this is your next computer. Either need something bigger and more powerful for you main computer or you need something as thin, light, and stripped down as possible—I assume. Up until now you would have tried to use an iPad and a keyboard, an 11-inch Air, or maybe a Chromebook if the computing device really needed to be disposable. If you needed something in the first category, this new MacBook was never for you, even if you desperately wanted it to be your computer. If you fall into the second category—needing something super light and portable—then this MacBook might be the computer for you. The are definitely a few things to consider, even for those who do need something thin and light. Let’s take a look at what this computer offers: both its strengths and weaknesses. 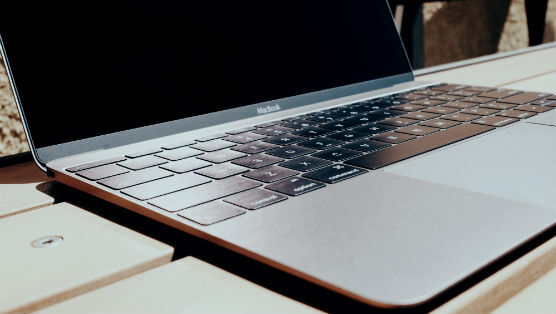 After gawking at the thinness—picking it up and holding it from every angle—the first thing you’ll notice once you start using the MacBook is the new keyboard. Part of making the laptop thinner meant taking some travel out of the keys. The result is that you’ll still want to pound on the keyboard the way other laptops demand. It isn’t necessary here and the lighter the touch, the more elegant the experience feels. It will take some time to get acquainted with the keyboard, but once you do, it should be better than whatever you’d been using previously. It took me two brief trials at an Apple store and a few hours using one at home—how I would typically use a computer—to get used to its feel. Looking up from the keyboard is the nice retina screen. Retina screens aren’t new though, in fact, it feels like the MacBook Air’s screens are now completely outdated. And it’s a shame those likely won’t get retina screens before being discontinued. Even though the MacBook only has a 12-inch screen you can alter the resolution to get the same real estate as the 13-inch MacBook Pro. As long as you don’t have an issue with vision, this is optimal for a smaller screen. There’s not much else to say about the screen, it’s great. Every computer should have an ultra sharp display. Under the screen is a large row of dots which house the speakers. There’s nothing inherently great about the speakers, at the end of the day they’re still tiny, but they are impressive for a machine of this size. They’re loud and present, and do seem to make it easier to hear talking than on my previous 2012 Retina MacBook Pro. One of the most interesting additions to the new MacBook is its USB-C adapter. This is the computer’s only I/O port and doubles as the place where you charge it. Right now there aren’t a whole lot of cables and accessories for USB-C, but I don’t think it will take too long before they become more common. In addition to more accessories, the new port opens up the possibility of charging the laptop from an external battery and using third-party chargers—both of which aren’t possible with other Macs. While the single port might be a little inconvenient at first, I don’t think it should stop you from considering the laptop if your other criteria lines up. I’ll give you an example why I think a fair amount of people, in 2015, are ready for a single port Mac. Google’s web-based Chromebooks have helped set the stage for us to be less dependent on internal storage. I think they’ve also encouraged less dependance on peripherals or use wireless based ones, like printers. Even if you haven’t used a Chromebook, their presence have influenced the industry to some degree. There are more syncing and backup features built-in to operating systems now. In the age of iCloud syncing photos, settings, and documents the Mac is edging towards a thin-client status where it shouldn’t take too long to get up and going on a new computer after you’ve put in your credentials. Some settings and files sync automatically. If you’ve bought or downloaded apps from the Mac App Store, for example, you can easily re-download those and have most things in place pretty quickly. Or maybe you use Dropbox, that’s fine too and another way to get pictures and documents kept in a liquid state—easily sync-able. In this regard, it might matter a little bit right now that the new MacBook only has one USB-C port, but it should matter a lot less than it would have a few years ago. In another two years, it should matter even less, yet it’s still fine and useable today, if your main objective is portability. The last thing you’ll probably notice is the difference in the trackpad. It doesn’t feel or look different so if someone told you that piece of glass that you’re pressing on isn’t actually moving you’d probably be shocked. Well, it’s not actually moving. There’s a haptic feedback motor under the trackpad which simulates clicks and can also allow for “deeper” presses. It feels like you’re clicking through the trackpad which is called Force Touch and allows for more gestures like dictionary lookups—hard pressing on a word. Overall the trackpad feels so natural that you shouldn’t even notice it, but it’s also gained more features. Even if you don’t use the extra features, there shouldn’t be any downsides. The screen, size, weight, keyboard, trackpad, and even the single port are all fine—if not great—but the laptop isn’t perfect. The webcam, for instance, is only 480p and is only passable—don’t try and use it in a place that isn’t well lit. The main aspect of the computer that’s up for debate, is its speed. Whether it’s up to the task of getting the stuff done you’d need to get done on a portable computer. I was initially worried that the 5-watt 1.1GHz Intel Core-M processor wouldn’t be up to the tasks, even though they’re relatively light-weight things. According to tests on the hardware from other reviews, it was like using a three year old computer in a new body. At least in initial usage, the speed has performed better than expected and is definitely useable. Again, I’m not editing videos and rarely edit photos other than quick touch-ups in the new Photos app. At one point, I had Evernote, Spotify, Mailbox, Ulysses (word processor), Tweetbot, and Safari with a few tabs all open and I didn’t notice any lag or slowdown. Unfortunately there have been other times when I did notice some lag—times you wouldn’t have expected. For example, when I was switching out my user profile icon in system preferences there was some delay. It hard to tell if this was only noticeable because I had just come from a faster 2012 MacBook Pro. For someone who really hates to see the spinner pop-up when a computer is processing data, I’m still not convinced that this MacBook is free and clear—I keep waiting for it crash and burn under a heavy load, but so far it’s been fine, even for the inpatient. After moving over ~13,000 photos, the battery definitely took a hit, but wasn’t too different than another Mac would have handled the increased work-load. Other than that battery performance was right around Apple’s 9-hour estimates—plus or minus depending on your tasks. This laptop is not for everyone, but I don’t think that part is up for debate. The truth is that the ones it is for are going to absolutely love it. The weight alone is a tempting proposition for those carrying their computers to and from work a lot. In the end, if you can deal with the potentially slower speeds that come with a lower power, fan-less, processor, and a single USB-C port doesn’t scare you, then there’s no reason not to go for the best looking laptop to-date. Everyone else should wait.